Lionsgate has been pretty dormant when it comes to releasing horror films on blu-ray, classic or not. So it came as much of a surprise when Lionsgate announced that they would be releasing Chopping Mall and Blood Diner on blu-ray. Today we get an even bigger surprise with the announcement of the Vestron Videos Classics Collector's Series. This series, which Blood Diner will makes its debut under, will focus the nostalgia angle of these releases. Each film will be restored in terms of picture and sound as well as having commentary tracks recorded. Featurettes and deleted scenes will round out the special features. Blood Diner is a 1987 film that has the term "cult classic" written all over it and is a perfect film to start out a brand new cult film series. 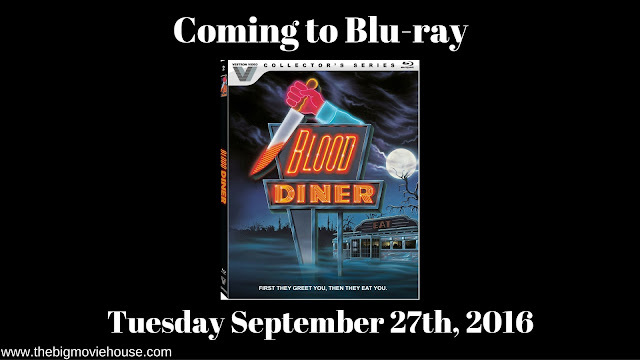 Blood Diner will be available from Lionsgate on Sept. 27 and will retail for $39.99. The releases are also supposed to be limited but I have no idea if they are going to be like the Disney Vault where the releases are given a certain amount of time before they are discontinued OR if they are going to be like Twilight Time and have only a certain number of copies available. We will see.